To say the least, today was a day of many firsts. So randomly I choose to get some exercise in, I decided to ride my bike to the dead lake to try out the new Air Stage and the Mummy Worms, after an hour of not even a nibble I almost gave up. I was using about 10 feet of 3.5 level line, three feet of tippet and one of the extra hooks that come in the owner keiryu rig kits. Normally I just fish plain keiryu or tenkara, but honestly, the fish I go for are so picky even great flies have a low success rate. Moderately bummed because I thought the Mummy Worms would be an answered prayer (keep reading) I decided to hit the nearby creek for a few, prior to my departure. Again no success... my worms would slowly descend and not even a nibble with either the green or orange worms. Not wanting to give up I decided that maybe the problem was not in the bait I was using, but in the way it was being fished. I decided to give it a twitch every so often but had no success. Finally, I said, you know what, I am gonna get that bait to the bottom of the creek with a split shot. Instant fish.... lesson for the day.... You can have the right rod, bait, location, conditions, but if your depth is not where the fish are, you could come out with nothing. So I was still using a pseudo ultra light rig and the fish began to came and a none day was turned into a many. You may be surprised to read this, but I have pretty much exclusively caught brim and other small panfish with my tenkara rods, whether I was using flies or red wigglers. 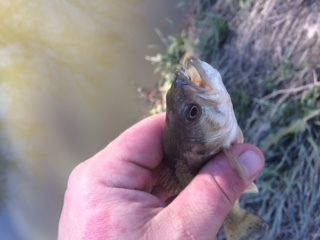 Well, today that changed, as my first fish on my 340 was my first ever tenkara large mouth bass. 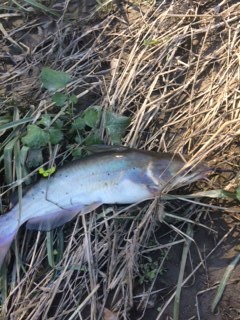 Additionally, somehow I hooked a freshwater catfish (also a first) on its back. Fighting a small catfish on a seiryu rod was exciting, to say the least. Both green and orange Mummy Worms provided hits quality. Not only should you buy the Mummy Worms, but you should buy an air stage 340 while they are still available. I have often found what you described--that depth can make all the difference. My wife and I usually (not always) have our best luck bumping nymphs, Mummy worms, butterworms, crickets, whatever, along the bottom. Even when we can see fish feeding on the top, many of our strikes come near the bottom of the water column. Since we live in Texas, I don't know if this is a warm water thing or not, but it's worth noting. Thanks for sharing. I've found the same thing when keiryu fishing. If your bait is too high in the water column you won't catch fish. Lower it to where you occasionally bump rocks and you will. For the Mummy Worms, I have found that I have to add at least a little weight, even in shallow streams. I would agree that the Air Stage 340 for $130 is a screamin' deal. Awesome rod. I'm glad that I'm not the only guy using fancy Seiryu rods to fish ditches and canals haha... I fish similar water here in central Alabama all the time, for panfish and bass. I haven't caught a catfish yet though! I will be ordering some mummy worms soon. I have the Mummy Worms, now I just need the weather to cooperate when I have time off to go fishing! I have been Keiryu fishing more and more, and I find that bouncing off the bottom works better most of the time. Light lines sink faster than heavier lines! I also believe that bigger fish often hang out deeper more often than coming to the surface. Cold water fishing is the same as warm water. I spent well over an hour at Cabelas a few weeks ago looking at the different lines that were available. I bought a new polymer bright yellow line that I am looking forward to experimenting with. It is very thin, but also very strong. I believe that with our awesome rods, we can get more feel and the bait down with less weight using light but strong lines and minimal shot. I have not tried Ultralight Worm fishing yet, but am looking forward to it this summer. I am resisting your other recommendation, as I have my eyes on my next rod, and it is longer than a 340! 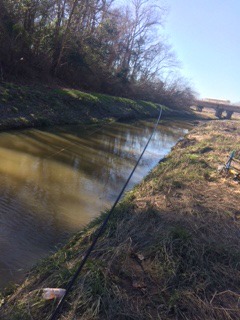 Yep, I totally look like a dolt using a very fancy rod to fish ditches with, but hey it works. I don't see a single other person able or even trying to pull fish out of where I get them. I am catching them... So everyone else must be coming home with nothing. I have many great rods that I love but I just keep fishing the seiryu rods cause even the smallest fish puts deep bends in the rod. The catfish really made the line sing. Thanks for the comments and patients, I typed that last post at 0430 in the morning and I was falling alseep as I typed. My wife's favorite fish to catch is the channel catfish, and she has her best luck just bouncing butterworms, or Mummy worms, or any ol' kind of worm along the bottom. Catfish have tough mouths, so it takes a bit of technique to get a good hook set with a light rod. Even a modest-sized cat will put a pleasing bend in most tenkara, keiryu, and seiryu rods. Keep it up! So all I did was put a single split shot about 8 to 10 inches above the hook and that seemed to do the trick. Then let the shot go to the bottom and I am guessing the soft current was just waving the worm in their faces. The 340 (and 390 for that matter) rod is sensitive enough to feel anything messing with your bait even without the yarn markers. The 340 and 390 are both fantastic and now I am wishing I had the 450 also. Even though the collapsed length is a big long, I really feel like you get unmatched smoothness in the bend profile. I am sure the suntech rods are even nicer, but I cannot pass up such a good deal. All I want now is an uber long keiyru rod and I'll be happy for a while. If you want a long Keriyu rod that is super smooth and perfectly balanced you should get a Suntech Keiryu Sawanobori 63. I am bold enough to say, if I had to give up all of my rods but one, this is the one I would keep. I know Chris is out of stock right now, but get your name in on one! It provides 20 plus feet of pure joy in fishing. That is my not so humble opinion. I have had fun landing 4 inch trout to 4 pound smallmouth bass in the heavy currents of the Snake River with it. When I go to Silver Creek this summer, and fish with it, I know it will handle everything in that spring creek. If I end up feeling it is too short, I am going to take the plunge and special order a 7 meter. That's a great recommendation les. Prolly a bit outside my price range at the moment. After all a cop's salary is not exactly great. I am looking at either the nissin two way in 53 or the field master 53 as I have the 44. Nissin rods seem to be more budget friendly at the moment even though the field master is definitely the nicest rod I have. I agree on the budget! I am looking to add a 53 to my quiver of rods as well. I have spent several hours of research on this site. The biggest issue I have with my 63 is the wind. It blows in Idaho! When it is blowing, I want to be able to step down to a little shorter rod. I have the Suikei Keryu Special 44 that according to Chris is the more flexible cousin of the Fieldmaster. I really love that rod too. It is the perfect zoom rod for fishing many of the streams I go to. My Special doesn't handle the wind very well. I am figuring I would like a 53 in the 30 penny range to deal with the wind. So, the Fieldmaster is in the running, but it is only twenty five bucks less than the Keiryu Sawanobori 53. If it is as nice as the 63, I'll give up eating out for a few weeks to make up the difference! The Keiryu Sawanobori 63 is so smooth when you cast it, and gives the best connection with the fish during the fight of any rod I have ever used. It isn't easy picking your weapons when you have so many great choices. Thanks for making it hard Chris! Personally, I think the Keiryu Sawanobori 53 is much nicer than the Field Master 53. I think you will like it at least as well as the 63 (I like it better). The Field Master 53 does give you three lengths, but I find that I fish it at full extension at least 90% of the time. If I know I will be on a smaller stream, and will need a shorter rod, I'll bring a Keiryu Special 44. If it's only 25 different I may not have an excuse. Great to hear your opinion Chris.